I have been meaning to write about how I make my winter bonnets for a while now, a while being over a year. I really want to share with you what goes into each of the bonnets I make. Why do I love working on winter bonnets? As you know, with my straw bonnets it is all about the art, the lines and curves that make up each style. For the winter bonnets, it is equally as much about the why and how of the construction, they layers and the materials. I love figuring out why a bonnet was constructed in a specific way, what the material choices were for, why this little area was done this way, etc. There is also something about the visual texture the quilting or wadding creates. I find it pleasant. I also get very, very cold in the winter. 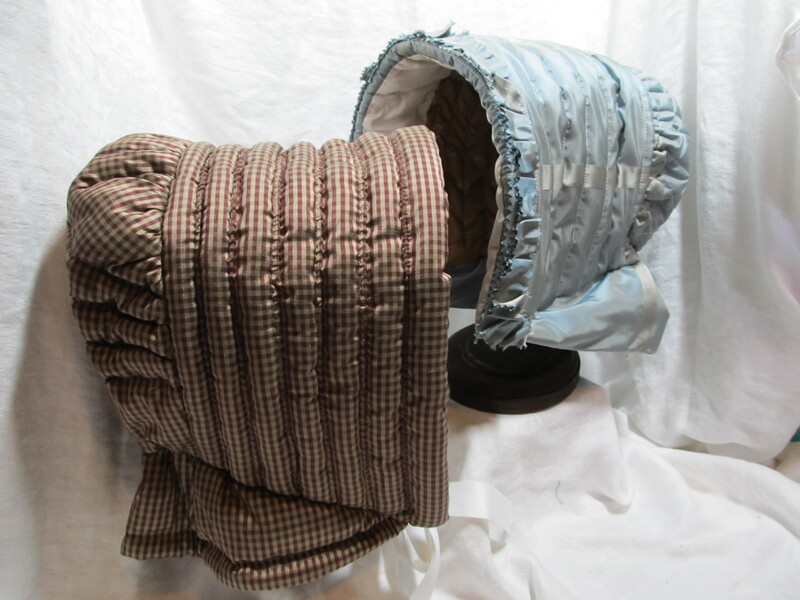 The soft, snuggly warmth of a wadded or quilted bonnet is comforting. I often want one of my 19th century bonnets for everyday wear during my frigid, pre-dawn morning commute. Each of the bonnets I am now making come directly from original bonnets in my collection. I have slowly been collecting winter bonnets with a variety of shapes and construction techniques. Each piece goes through my version of a conservation process (how I wish I had the resources to do everything I would like), ensuring there are no buggy nasties, helping the all too often crushed, scrunched, flattened fibers back into shape and stabilizing. Once I think a piece is ready and I am ready to focus on a piece, I have a note taking process that I am sure would make some people’s heads turn sideways in puzzlement. Hey, it works for me. From my notes, I draft a pattern. These patterns are what I use for creating my winter bonnets. I try to use the same types of materials I find in original winter bonnets. Sadly, as with many things, we simply do not have the same silks they did in the 19th century. Of the fabrics we do have, I use silk taffeta, tight weave silk twill, silk faille, some special weave silks and tight weave smooth wool. For linings, again, I use what originals bonnets show – polished cotton, cotton prints, cotton weaves, silk and tropical wools. For the batting and wadding, I use 100% wool batting. Occasionally, I will layer 100% wool batting with 100% cotton batting to get the right loft and firmness. Depending on the bonnet, I use a variety of lofts and layering. I refuse to use polyester batting. I do not think it is warm enough or gives the look of original bonnets. Due to allergy issues, I will consider using just 100% cotton or alpaca/cotton batting. How do you know which bonnet will be right for you? When choosing the right winter bonnet for you, I suggest thinking about the type of weather you have in your area and/or where you will attend events. Picture when you were out in the snow last winter, did the snow stick to your coat and hat? Was the snow wet? If you are in an area with sticky snow, I suggest a very smooth fabric like a silk taffeta. If you have wet snow, the tighter weaver the better. For wet snow, you really want a wool batting, I’d even consider silk interlined with a light wool fabric. How do you trim your bonnets? I look to originals to determine what kinds of trim I will use. While period fashion columns do suggest some additional trims, I have yet to determine to what extent these trims were actually used. So far, I have stuck to ribbon and silk trim. I may venture into tassels and beading. Maybe. For the functional ties, I have found I love cotton sateen. This is entirely Eileen Hook’s fault since she showed me the cotton sateen she picked up at Needle and Thread. Cotton sateen is durable and ties nicely. I anticipate it doing very well in the wet of winter. For decoration, I do prefer silk ribbon, but will also use high quality modern ribbons such as Hyman Hendler’s. How do you quilt your bonnets? Far prefer doing quilting by hand. I like the look of hand quilting more than that of machine quilting. That said, hand quilting can take a long time, a very long time in some cases. Yes, this has to be reflected in the price. I understand machine can be faster, making a bonnet more affordable. In addition to the time/cost factor of machine quilting, there are occasions when a piece wants a tighter quilting than I can currently get with my hand quilting. I often end up arguing with myself over which approach to take, that of the tighter machine quilting and that of hand quilting. What is the deal with wired and unwired? Why do I show photos of the insides? I want to show you how I finished the insides because I know some people like pretty finished seams. As with originals, sometimes I make the seams pretty and sometimes I leave them. Do I have an Etsy shop? These are very pretty. It just doesn’t get cold enough here for one of these. Do you ever sell your patterns or instructions? I have one pattern available on Etsy. That pattern was taken from a general study. A future publication is a possibility.